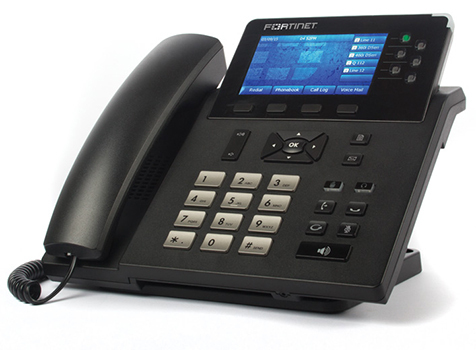 Whether you're looking for an entry level or executive level IP phone, stay connected to your calls with a FortiFone IP phone. Each FortiFone is a feature-rich experience with high quality audio and dedicated keys for the most common features. The FortiFone experience offers a range of options from phones that can be used in a hotel or waiting room, to phones that offer vivid color screens, with programmable line and extension appearances. Managing calls has never been easier. HD quality audio What good is a phone if you can’t hear your caller? That’s why each of the FortiFones deliver crisp, clear audio through the handset and speaker. Visual notifications Always be up to date on calls with easy to see missed call and voicemail notifications. Key appearances* Programmable key appearances give you the power to not only monitor lines and extensions, but you can also program the keys for a number of features available on the FortiVoice. With a large, vivid color display, premium audio quality in both the handset and speaker, the FON-470i is a great phone for any office. The dedicated feature keys and 6 programmable appearance keys give you the power to easily control your calls. All of these features and more give the FON-470i a lot of bang for your buck. The FON-C70 conference phone offers you a premium HD audio experience. With full-duplex technology and acoustic echo cancelling on the three microphone array, you get clear and concise audio. Add on the ability to connect two extra microphones and the FON-C70 can handle a conference room of any size.